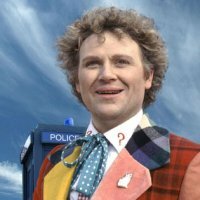 Colin Baker is probably best known for playing Paul Merroney in The Brothers from 1974 to 1976 and as the sixth incarnation of the Doctor in the long-running science fiction television series Doctor Who, from 1984 to 1986. Originally studied to become a solicitor. At the age of 23, he changed professions and enrolled at the London Academy of Music and Dramatic Art (LAMDA). Colin also guest starred as Bayban the Butcher in a 1980 episode of Blake’s 7. In 1983 Colin made his first appearance in Doctor Who as Commander Maxil in the story Arc of Infinity (1983). Producer John Nathan-Turner described Baker’s performance as being “quite arch” and a little sassy. Maxil was one of the few characters actually to shoot the Doctor, then played by Peter Davison. It has been jokingly suggested that he got the part of the Doctor by killing the incumbent. He has returned to the role of the 6th Doctor in numerous audio stories and webcasts, most prominently in the Big Finish audio range. Other ‘Who’ appearances include; Dimensions In Time charity special, the video game Doctor Who: Destiny of the Doctors, various light entertainment shows such as Top Gear, The Weakest Link and the stage play Doctor Who – The Ultimate Adventure. In 1992, Colin Baker became the first Doctor to write a published Doctor Who story, “The Deal” as part of Doctor Who Magazine’s Brief Encounters series. In 1994 Colin wrote a complete comic strip, The Age of Chaos featuring the Sixth Doctor and Frobisher, his Penguin companion. To many Colin will always be Dr Who, but to the residents of South Buckinghamshire he is a weekly voice of sanity in a world that seems intent on confounding him. He writes a regular feature in the Bucks Free Press. Two fantastic compilation books of his columns have been written, the first being entitled ‘Look Whos Talking’ and a wittier read you could not wish for. Both should be available from Hirst books. Before and after Doctor Who Colin has had a prolific theatre career, including several Shakespeare festivals, appearing in productions of “Macbeth” and “Hamlet” and having highly successful runs of “Corpse” and “Deathtrap” and “Run for Your Wife” with Terry Scott. In recent years, Colin has appeared on a number of DVD releases of his episodes and his continued portrayal of the Sixth Doctor in the Big Finish audio stories has earned him high critical acclaim, most deservedly so. Most recently, in the latter half of 2010, Colin Baker played the part of Inspector Morse in the new stage play House of Ghosts. Colin excelled as the epoynmous Morse, making the role his own. A fantastic adaptation that we, the Exewing thoroughly enjoyed and can highly recommend. For more information about Colin and his career please see the links below.